According to the latest Futuresource Interactive Display Market Report by Futuresource Consulting, interactive flat panels (IFPDs) continued to be a considerable success in 2016 in the education and corporate markets. By Q4, 68 percent of all interactive display sales were IFPDs. The growth has been significant, with a CAGR of 59 percent from 2013 to 2016 and growth is forecast to continue. The interactive whiteboard (IWB), the original technology, is in decline. However, combined the two technologies contributed to 1.6 million displays in 2016. The U.S. had a 24 percent annual volume growth, value grew by 36 percent with rapid transition to larger size IFPDs, and half of sales are now sizes greater than 70 inches. More than two-thirds of U.S. classrooms now have an interactive display, and the level of growth is forecast to continue. This market has previously been dominated by suppliers that had originally developed their products to service education markets, designed for teachers’ daily use. To date, uptake of interactive displays in the corporate sector has been limited. There has been criticism of solutions as over-engineered for corporate markets, where users are much less likely to use the technology regularly, and thus needed increased simplicity. With an almost untapped market of 32 million corporate meeting rooms globally and well fewer than one million displays installed to date, the opportunity is significant. The entrance to the market of global tech giants, Microsoft, Google, and Cisco is changing the industry dynamic. These providers are leveraging their existing infrastructure and collaboration solutions to bring a completely new value proposition to market. The new entrants are promoting simple, all-in-one meeting room solutions. Users can create using touch interactivity, share content among attendees (both remotely and in-room), and call via voice or video. Embedded cameras, speakers, and sophisticated microphones encourage a high-quality interaction as well as easy setup and continuous workflow. These displays have features such as automatic switch-on when someone approaches, or one-touch switch-on. The corporate market is expected to reach 500,000 annual sales by 2021. New interactive touch technologies such as FlatFrog InGlass technology is used by at least five major brands, and provides a highly accurate touch experience. Dell, NEC, and HiteVision have all added the technology to their high-end ranges. Projective Capacitive (PCAP) technology, often found in the mobile device industry, is also starting to appear, and is used in products such as Microsoft’s Surface Hub and Cisco’s Spark Board. 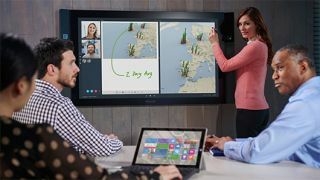 Many displays also have embedded PCs, so they become stand-alone devices, such as the Microsoft Surface Hub that also integrates existing Microsoft platforms such as Office, Skype, and OneNote. Futuresource’s 86-page report examines the current state of interactive display market across 67 countries, exploring market segmentation, drivers, and barriers, as well as detailed five-year forecasts. For more information or to make a purchase, please get in touch with Leon Morris via leon.morris@futuresource-hq.com.